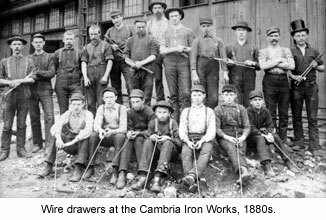 Founded in 1852, the Cambria Iron Company of Johnstown made an important contribution to American industrialism – it is considered one of the greatest of the early modern iron and steel works. Forerunner of Bethlehem Steel Company, United States Steel Corporation, and other late 19th and 20th century steel companies, the Cambria plant became a model for the industry. In the late 1800s Johnstown attracted the best and brightest minds in the industry, notably William Kelly, George and John Fritz, Daniel J. Morrell, Robert W. Hunt, William R. Jones, and Alexander Holley. These men advanced iron and steel technology through invention and industrial design in Johnstown, work which was widely copied by other iron and steel companies. This enormous contribution signaled the end of America’s reliance on British-produced rails and allowed the expansion of the nation’s railroad network. 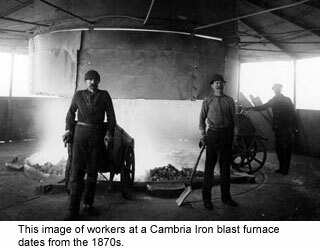 Before Cambria’s founding in 1852, only a very few small-scale blast furnaces and foundries existed in Johnstown. At that time, Johnstown and its suburbs had a population of about 5,150. But the city was blessed with abundant deposits of iron ore, coal, wood, a water supply. 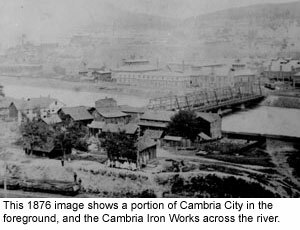 With the arrival of the Pennsylvania Railroad in 1854, Johnstown became an ideal location for the Cambria Iron Works. After a few difficult years the company took off, and by 1858 it had become one of the nation’s largest producers of rails. As the mill grew, thousands of immigrants, many from Southern and Eastern Europe, came to Johnstown to work in the steel mills and coal mines, and many settled next to the mill in the area of Johnstown still known as Cambria City. 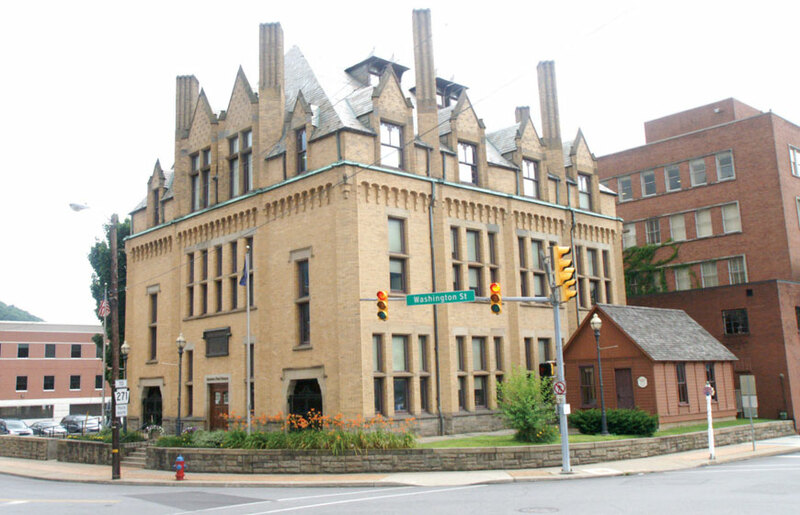 By 1890, Johnstown’s population had increased to 30,114. In the 1880s, the company added an open-hearth steelmaking facility, but was becoming less important nationally as other steelmakers in Pittsburgh, Chicago, and Cleveland gained prominence. The 1889 flood did comparatively little damage to the Lower Works of the Cambria Iron Company, although the Gautier Works, located in Woodvale, was completely destroyed. 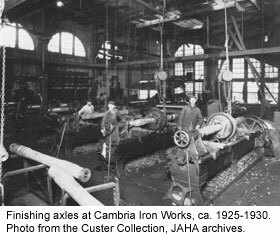 In 1898, the Cambria Iron Works was reorganized and renamed the Cambria Steel Company, and built a new, modern steel mill in Franklin Borough, east of Johnstown. 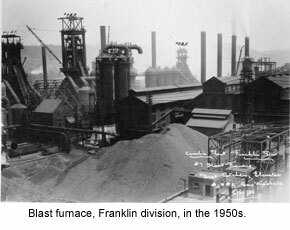 The Franklin mill included blast furnaces, a steel railroad car department and open hearths. The company slowly rebuilt the Gautier Works to produce wire fencing, plows and other steel products for the agriculture industry. A wire plant was also built in the Morrellville neighborhood. In 1988, Johnstown was identified as one of two sites having the most intact structures dating from the nation’s earliest steel companies. The Cambria Ironworks was listed as a National Historic Landmark by the National Park Service in 1989, and remains the only American steel mill to have received this designation. 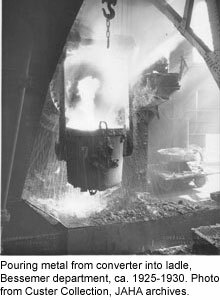 Although the heyday of steel in Johnstown is long gone, the city holds a well-earned place in steelmaking history. It was the site of several major technological innovations that were copied throughout the nation and the world, including early use of the Bessemer process for refining steel and many new methods of heating, handling and rolling steel. Today, the Johnstown Area Heritage Association interprets the story of the immigrants who came to work in the mills and the mines through the Heritage Discovery Center’s permanent exhibit, “America: Through Immigrant Eyes.” The Iron & Steel Gallery includes images of the steel industry in Pennsylvania, memorabilia from Johnstown’s steel mills, and “The Mystery of Steel,” a multiscreen film that gives an overview of Johnstown’s importance in the steel industry. 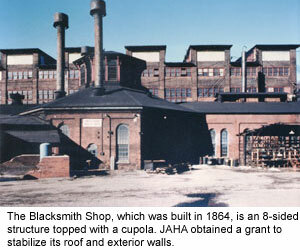 JAHA is also working to conserve the 1864 Blacksmith Shop, the most historically significant building remaining in the Cambria Iron & Steel National Historic Landmark. Sources include: Sharon A. Brown, “Historic Resource Study: Cambria Iron Company,” published by the National Park Service for the America’s Industrial Heritage Project.